As a massive fan of Horror, if there is one thing that stands above the rest is how Horror films are marketed. The Horror film poster has created some of the most iconic imagery within cinema. So as Halloween is coming up, here is a list of the top 10 Horror Film Posters. A simplistic poster that has Mia Farrow’s face faded with a single pram on a hill. The imagery is simple but very effective. The poster does not give anything away but creates a intriguing mystery about the child and mother. What really makes this poster so effective is Mia Farrow’s blank expression. It’s chilling that the sole focus is that pram. If we look at the history of horror, children are truly the most scariest things in the world. 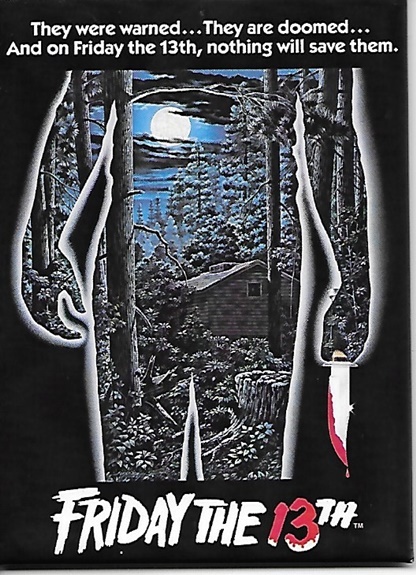 Friday the 13th has a great poster that has a pristine painting of a cabin looking over the lake. The painting is shaped with a person holding a bloody knife. The conflict between the beauty of the scenery and deathly figure of the killer is a perfect encapsulation of the film. Camp Crystal Lake has a gentle beauty to it but it has a dark past. The poster is topped off with a cheesy but great tagline, ‘They Were Warned… They Are Doomed And on Friday the 13th, Nothing Will Save Them’ Just Perfect. The majority of these posters are simple, the iconic Evil Dead poster has a woman that is grabbed by a hand from the ground and she is screaming for help. This poster has made a recent appearance in the hit Netflix show Stranger Things on Jonathan’s bedroom wall. This poster does not reflect the actual film that is full of guts and gore but it does immediately tell the viewer that whatever is attacking the unsuspecting victim is not good. A simple and iconic image of horror and who would’ve thought that the traditional horror would turn into a franchise it eventually did with Ash and his chainsaw. Just complete madness. Dario Argento is one of the masters of horror and suspense. Suspiria has become one of the most applauded horror films of his filmography. However it is his lesser known Tenebre that provides a chilling film poster. The ghostly white woman laying dead with a single trail of blood is another example of less is more. The imagery of death evokes extreme feelings of fear. The image also provides a mystery that does not tell you anything about the film and therefore entices the viewer to watch the film. 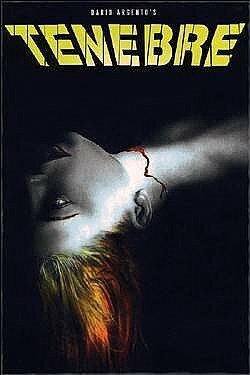 This poster had some controversy in Britain, the film was banned for sale until 1999 and the poster was modified so instead of the slashed neck it was replaced with a red ribbon. In hindsight it is a comical change but it does show the effect of the image it had on censor. This poster is silently terrifying that had a chilling effect on the audience, distributors and censors. The creepy staring eyes, the striking red and the sole character walking through the streets of a deserted London. The poster is attention grabbing and a clear warning of the horror within the film. This looks more like a warning poster than a poster for a film. This poster is so effective because of the use of the colour red, alongside the use of the yellow infected eyes which looks deep into the person viewing the poster. Creepy, striking and attention grabbing, perfect for a horror film poster. One of the most iconic taglines in movie history. 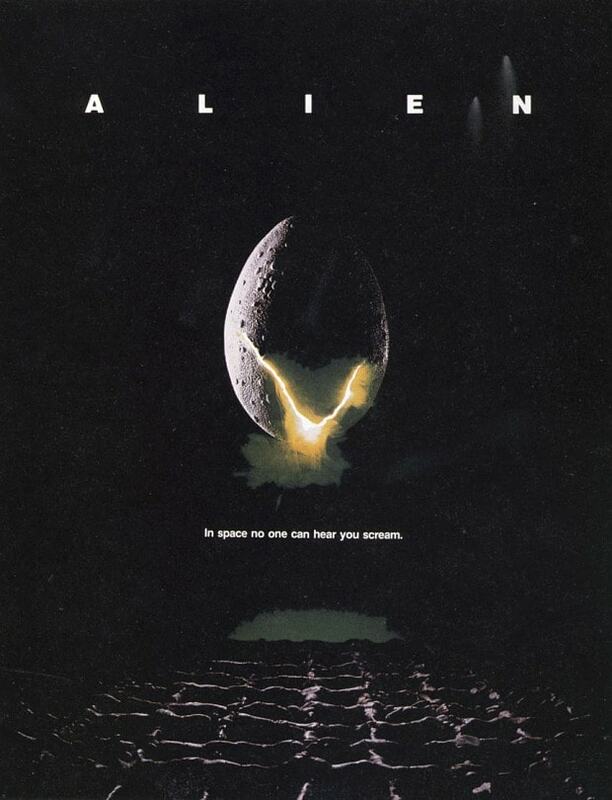 ‘In Space No One Can Hear You Scream.’ And a single egg in the middle of the poster with a luminous green light coming out of it. What’s in the egg, why is it shining green? Why is there a waffle at the bottom of the poster? There is so much mystery and intrigue into this poster. Simplicity makes the best posters and this is another example of this. Eight single words can sell one of the greatest horrors of all time. 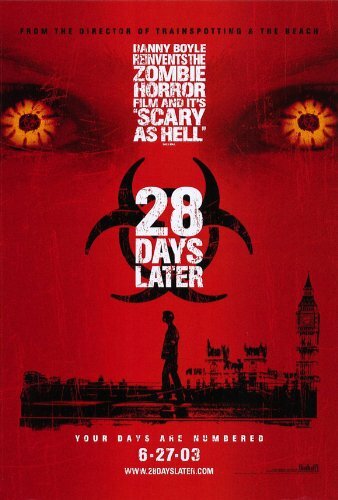 The poster encapsulates the film’s themes of isolation and dread. If this did not make you go to the cinema then I do not know what would. 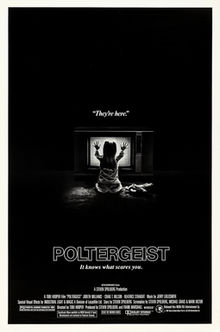 Poltergeist uses the same techniques as Alien on their poster. A minimalist poster of a child putting her hands to the TV screen with the two words, ‘They’re Here’ The use of space in this poster is used well with the child enrobed by the darkness with a single source of the light coming from the television. The image of child saying They’re Here terrifies me. They say that children are more susceptible in connecting with the paranormal world and when a child mentions they are here you know it is not going to be good. The stark contrast of white and black creates a chilling effect that enhances the isolation of the child. The bottom tagline mentions that ‘It Knows What Scares You’ and if ‘it’ is the poster makers then it definitely knows what scares me. This is one of my favourite posters in cinema not because it is the scariest but because there is a few questions I have about it. The girl does not look like Nancy, the finger glove does not look like anything like that. The hand glove on the poster is more akin to Wes Craven’s New Nightmare. Also why is there a floating skull face above Nancy? I know it is supposed to symbolise Freddy Krueger but I feel like the image of Freddy Krueger would of sufficed. Nightmare on Elm Street is one of my favourite franchises and this poster personally is one of my favourites as when I saw this as a child, I was terrified. The tagline is also creepy, ‘If Nancy doesn’t wake up screaming, She won’t wake up at all’ Just brilliant, Horror really does have the best taglines ever. One of the most iconic movie images in the history of cinema, the Jaws film poster is a true craft of simplicity and hidden terror. While the woman is gleefully swimming in the sea, unbeknownst to her there is a giant great white shark right below, ready to eat her. It is a simple exercise of not knowing what lies beneath and stealing from the tagline of the awful Jaws sequel, ‘Just When You Thought It was Safe To Go Back To Water.’ Jaws was iconic in the fact that it was classed as the first summer blockbuster and made hundreds of millions of dollars. I am sure that without this brilliant poster, history would of been very different. The Exorcist is a terrifying film that is made more horrifying and suspenseful just by this single image. The exorcist standing beneath the lamppost, with the shining light coming out of the window along with the Gothic fence creates an intriguing and chilling image. Whenever I see this poster I always hear Mike Oldfield’s Tubular Bells. The use of strong contrasting between the light and the shadows enhances the anticipation of fear and dread. There is something so chilling about seeing the image of that man that is ready to meet his doom. The fact this is happening in any old house on any old street intensifies the horror of this poster. As a child I was scared of The Exorcist (I know I shouldn’t of been watching it) but whenever I see this poster it just reminds me of the horror and how terrified I am of the film. I have never been so scared of a film poster and for that is why The Exorcist is the greatest horror film poster of all time.